Brendan O'Carroll (born 15 September 1955) is an Irish writer, producer, comedian, actor, and director, best known for portraying foul-mouthed matriarch Agnes Brown on stage, and in the BBC and RTÉ television sitcom Mrs. Brown's Boys. In 2015, O'Carroll was awarded the Irish Film and Television Academy Lifetime Achievement Award for his contribution to Irish television. The youngest of 11 children, O'Carroll was born in Finglas, Dublin. His mother, Maureen, was a Labour Party TD and his father, Gerard O'Carroll, was a carpenter. His father died in 1962 when O'Carroll was seven, and Brendan's mother raised their eleven children with little money. He attended Saint Gabriel's National School and left at the age of 12. He had a string of occupations; these included being a waiter and a milkman. Having become well known as a comedy guest on The Late Late Show, O'Carroll released four stand-up videos, titled How's your Raspberry Ripple, How's your Jolly Roger, How's your Snowballs and How's your Wibbly Wobbly Wonder. O'Carroll wrote the screenplay to Sparrow's Trap, a boxing movie. The film, which had Stephen Rea cast in the lead role, ran into financing difficulties midway through the shoot when the distributor withdrew and it was abandoned. Incurring debts of over €1 million, O'Carroll became bankrupt and the film has never been produced. O'Carroll presented a quiz show, called Hot Milk and Pepper, on RTÉ One, with long-term collaborator Gerry Browne. In 1992, O'Carroll performed a short radio play titled Mrs. Brown's Boys and shortly afterwards he wrote four books titled The Mammy, The Granny, The Chisellers and The Scrapper. In 1999, a movie named Agnes Browne, starring Anjelica Huston, was released, based on his book "The Mammy". O'Carroll also co-wrote the screenplay. He then decided to put together his own family theatre company, Mrs. Browne's Boys, and dressed up as a woman to play his part, as the actress he had originally hired failed to turn up. From 1999 to 2009, he wrote and performed in five plays. Since 2011, the stage shows have been re-toured across the UK. In 2011, his plays were adapted into a television sitcom (with the name "Browne" shortened to "Brown"). So far, from 2011, 28 episodes have aired, across three series, several Christmas special episodes and a one-off live episode that aired in 2016 on RTÉ One and BBC One. Mrs. Brown's Boys D'Movie was released on 27 June 2014, and was a significant success in the UK, staying at number one in the box office for two consecutive weeks. However, the film had negative reviews; one saying it was not just unfunny but "close to anti-funny". O'Carroll's wife, his sister Eilish, his son Danny and his daughter Fiona, all appear or have appeared on episodes of Mrs. Brown's Boys. It was announced in January 2015 that the BBC wanted O'Carroll to do "other stuff", due to the fact that Mrs Brown's Boys had become so successful. He revealed plans to adapt his first ever written play, The Course into a television sitcom. O'Carroll was married to Doreen O'Carroll from 1977 to 1999. He married Jennifer Gibney in 2005. O'Carroll has three surviving children: Danny, Fiona and Eric. O'Carroll's first son, Brendan, died from spina bifida when he was just a few days old. O'Carroll's paternal grandfather, Peter O'Carroll, a father of seven and a prominent republican, was shot dead on 16 October 1920 at his home in Manor Street, Dublin. Two of his sons were Irish Republican Army volunteers. The incident was investigated in the television series Who do you think you are? In March 2016 O'Carroll appeared in the BBC2 documentary Brendan O'Carroll – My Family at War, which explored the involvement of three of his uncles – Liam, James and Peadar O'Carroll – in the Easter Rising. ^ McGreevy, Ronan (27 April 2011). "Necessity the mammy of invention as O'Carroll's Mrs Brown is up for Bafta". The Irish Times. ^ a b Profile, BBC. Retrieved 14 September 2015. ^ "The man behind Mrs Brown's Boys speaks about his tragic loss". The Sun. 27 June 2014. Retrieved 19 January 2017. ^ a b c "Brendan O'Carroll profile". Retrieved 14 September 2015. ^ Ronan Kerr. "Brendan O'Carroll: The Stand Up Collection 4 DVD Box Set, Great Price, Free Delivery". Web.archive.org. Archived from the original on 20 January 2015. Retrieved 30 December 2015. ^ a b Young, Richie (3 October 1997). "Movie Hat-Trick for Big-Shot Brendan". Irish Daily Mirror. Retrieved 16 October 2015 – via Questia Online Library. (Subscription required (help)). ^ a b Quigley, Maeve (17 February 2013). "'I Am Mrs Browne's Boy!' SINGER GERRY SAYS HIS MUM INSPIRED PAL'S HIT SHOW". Irish Daily Mirror. Retrieved 16 October 2015 – via Questia Online Library. (Subscription required (help)). ^ a b Taylor, Richie (23 March 1998). "I'LL PAY BACK Pounds 2M DEBT; Comic O'Carroll's Cash Pledge". Irish Daily Mirror. Retrieved 16 October 2015 – via Questia Online Library. (Subscription required (help)). ^ Quigley, Maeve (31 December 2011). "I Wasn't an Actor but 2 Days before a Show the Guy Playing Rory Left. by Monday Night I Was in Front of 1,300 People; BROWN MRS ON HIS STAR TO FAME RISE". Irish Daily Mirror. Retrieved 16 October 2015 – via Questia Online Library. (Subscription required (help)). ^ Swords, Warren (6 February 2011). "Mrs Brown's Debt; TV Comic Brendan O'Carroll Was Forced to Repay €150k He Owed to Clerical Abuse Victim – but Only after He Was Dragged into Court". Irish Mail on Sunday. Retrieved 16 October 2015 – via Questia Online Library. (Subscription required (help)). ^ Profile, cineworld.co.uk. Retrieved 28 September 2015. ^ Brendan O'Carroll profile, thegenealogist.co.uk. Retrieved 13 September 2015. 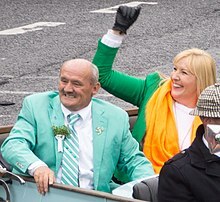 ^ "Brendan O'Carroll: Comic says 1916 Easter Rising lessons 'not learned'", BBC. Retrieved 18 March 2016.